앞면 Effigy of Queen Elizabeth II and the words "Elizabeth II Australia 100 Dollars 1 oz 9999 Gold 2016"
뒷면 Colourized Monkey King and the words "Year of the Monkey" and the Chinese symbol for "monkey"
1온스 2016 퍼스 조폐국 원숭이왕 색채 금화 This has a limited mintage of only 41 coins that were released and features a full colour design of the mythical Monkey King! 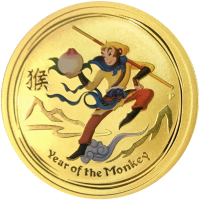 For 2016, the Perth Mint's internationally renowned Australian Lunar Gold Coins celebrated the Year of the Monkey, the ninth animal in the 12-year cycle of the Chinese zodiac. These superb quality releases are perfect for people born in "monkey" years - 1944, 1956, 1968, 1980, 1992, 2004 and in 2016 - who are regarded as clever, intelligent, flexible, quick-witted and versatile. Personality traits like gentleness and honesty bring them an everlasting love life. The reverse of each coin depicts the Monkey King known as Sun Wu Kong with his battle staff. Mountain tops are visible in the foreground and background. The Chinese character for "monkey" and the inscription "Year of the Monkey" also appear in the design along with The Perth Mint's traditional "P" mintmark, the year and weight. As well as appealing to gold coin collectors, these outstanding releases also make great gifts for people born in any year "ruled" by the Chinese lunar monkey.